The first large model I made when I got in to making models for 3D printing was based on the platform footbridge at Kirby, Furness in Cumbria. The N Scale version of this model was featured in Model Rail magazine. Unfortunately the OO scale model has suffered from Shapeways pricing re-structuring, that now charges with an emphasis on space taken up in the machine, rather than the amount of material actually printed. Hopefully the pricing model will be updated again and the price will fall. The model is also available in HO Scale. The "real size" dimensions of the bridge are shown on the drawing on the right. Click on the picture to get a larger view where you can easily reed the dimensions. Just divide the dimension by your scale to arrive at the models dimensions. The bridge is designed to span platform to platform across a double track. The N Scale model is printed in Frosted Ultra Detail. This material sometimes has a waxy residue from the printing process. A careful wash in soapy water is recommended before painting. 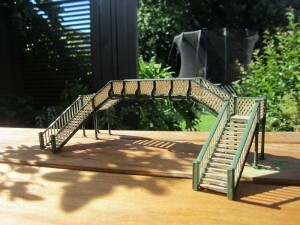 In response to a request from a customer modeling in HO Scale, the Kirby style footbridge was also made available in 1:87 scale. The bridge can be ordered in either Frosted Detail or Frosted Ultra Detail material. The OO scale model is printed in SWF Nylon and takes all forms of paint well. The material has a fine textured grain which looks great on the stair treads. The handrails benefit from a light sanding to achieve a smooth texture.